If you've ever driven down Harbor Boulevard near the Disneyland Resort there's no doubt in my mind that you've noticed this castle-themed hotel not far from Disneyland's main entrance. The Castle Inn & Suites, located at 1734 S. Harbor Boulevard, is where I spent four nights earlier this year during a visit to Disneyland for a long weekend of runDisney races. I booked my stay here because I was enticed by the combination of the price and location. I was able to secure one free night through a travel provider, and while excited about my trip, was a bit apprehensive as I hadn't been to this property in over 10 years. To my surprise - the hotel has been renovated and the rooms were much bigger than I remembered! The standard room features 2 queen beds, 1 small dining table and chairs, 1 desk with a chair, a refrigerator television and microwave, drawers and an armoire. The room is much bigger than many of the rooms I have stayed in at the hotels along Harbor Boulevard. I was situated on the 4th floor of the hotel near an elevator. Although at times I could hear suitcases rolling by, for the most part my stay was quiet. I even went to bed one night right after the fireworks and I slept like a baby. I am a really neat and tidy traveller who loves to stay well organized, so I appreciated the size of the room but did feel it was too big for just me. A larger family can really take advantage of the room size. There's nothing worse than stepping all over suitcases and shoes when you're on a family vacation and I know that wouldn't happen here. The vanity and shower area were of a decent size as well. The floor around the vanity lending itself to even more storage space for bags and shoes if needed. I didn't like that there is not a partition of some sort separating the vanity area from the rest of the room. As an early riser that's something I always look for in a hotel room. Especially during a race weekend. I feel awful turning on the lights at 3:00 AM. However, with this set-up you can use the light from the shower to illuminate the vanity area. Standard shower and tub with curved rod were clean and worked perfectly. Toiletries are ok, I would suggest bringing your own favorites if you have sensitive skin, etc. 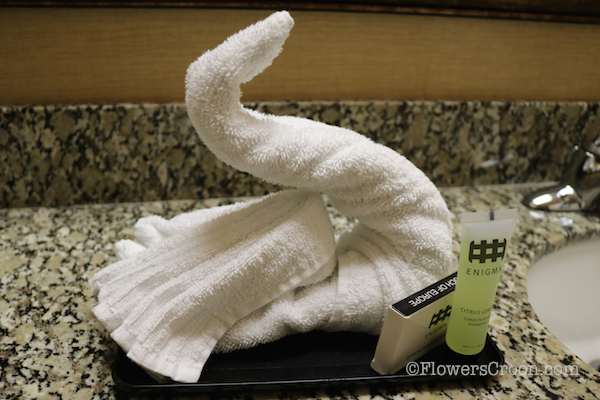 The little touches like the towel animals are cute. Overall I had a pretty great stay here at the Castle Inn and Suites. My bed was comfortable and the room was clean. Really clean. That is important to me. I didn't experience any old or musty or moldy smells as with some other properties. The air conditioning unit worked fine - pretty cold in fact - so I also had no issues with temperature. There is an on-site gift shop - perfect for buying water before heading to the parks. The front desk staff was really friendly and very helpful to me when I was trying to figure out how to get back to the airport (Uber was the best choice). There were people using the pool, so it really must have been heated which is nice. If you drive down I am very happy to say the hotel allows free parking for 1 car per room. That's a huge perk! Of course the question I am asked most by families traveling to Disneyland about ANY property is: "HOW CLOSE IS IT TO DISNEYLAND?!" This property is very close. Cross the street walk about 5 minutes and you're there. If you need more info than that think it's just a bit more than one lap around a track (maybe .3 miles). Bottom line: Yes, I recommend the Castle Inn & Suites for a Disneyland stay. It's not fancy, but it is charming and exactly what anyone spending hours at the park needs.